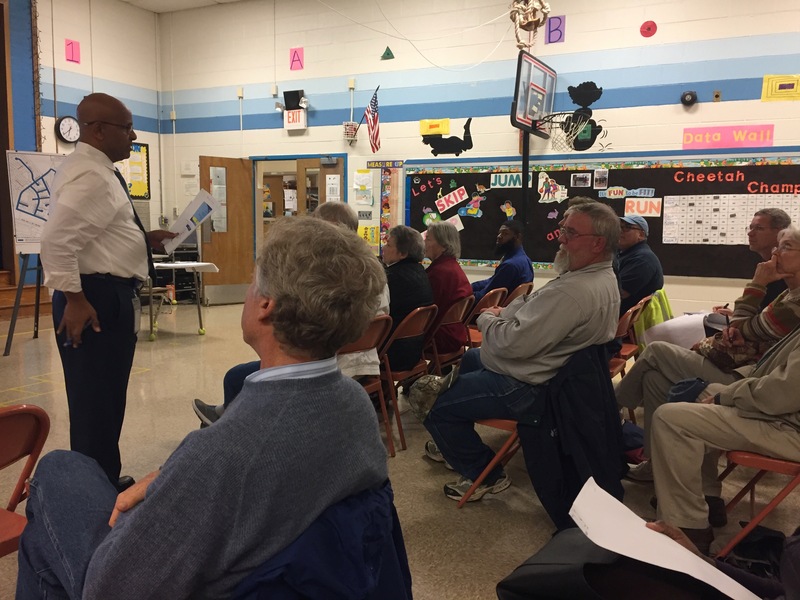 A dozen residents attended an information session on the replacement of water mains in the Twinbrook neighborhood of Rockville last night to learn more about the extent and impact of construction during the next two years. The Washington Suburban Sanitary Commission, one of the largest the water and sewer utilities in the nation, serves portions of Rockville and will be replacing the nearly 8 miles of water mains and installing 0.18 miles of new sewer lines in the area roughly bounded by McAullife, Linthicum, Marcia, and Meadow Hall with sections out Tweed Street and Twinbrook Parkway to Viers Mill Road (that’s 332 homes; see map below for details). 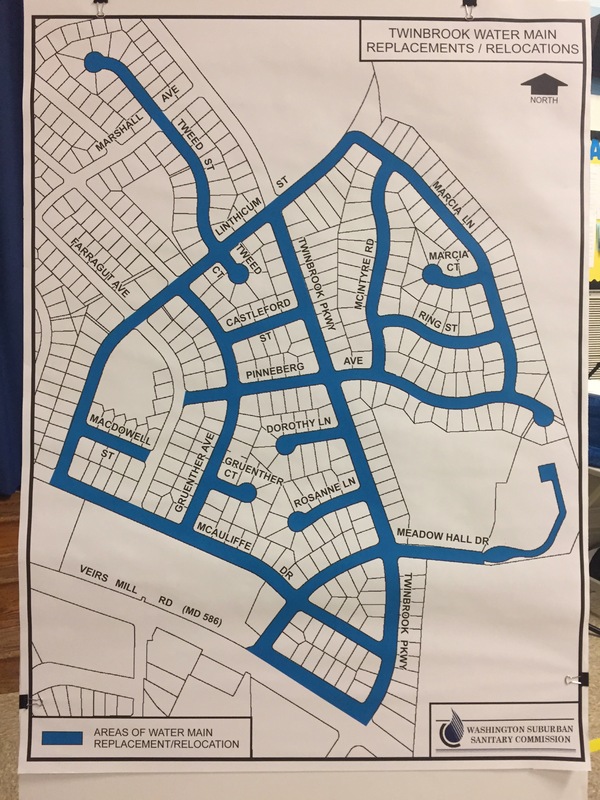 The post-war neighborhood of Twinbrook is now passing the 50-year threshold, which means that the lifespan of the water system is coming to an end, a situation that’s affected other parts of Rockville as well. Map showing the streets and houses affected by the water main replacement project in 2017-18 in Rockville, Maryland. Construction is slated to begin in spring 2017 and last for two years, working from Monday to Friday from 8 am to 5 pm in good weather. They’ll be using an open-cut method, which means that a wide trench will be cut in the street to reach the old water pipe and replace it with a larger one (e.g., 4″ diameter pipes will be replaced with 6″ ones)(video). During construction, that portion of the street will be reduced to one lane and parking will be prohibited. That will be tricky for streets that are especially narrow or have lots of on-street parking, such as Roxanne Lane, who will have to park on adjacent streets for a couple days. It will also add to the traffic congestion on Twinbrook Parkway (a popular east-west throughcut) and around the Carl Sandburg Learning Center (whose busses arrive from throughout the county), but construction will include flagmen to control traffic. Work is phased and only a small portion of a street will be affected, so again, direct impacts will last only a few days. Secondly, WSSC assured residents that no one will become a “prisoner in their own home” and they will be able to enter and leave when needed (if a trench is open in front of your house, they’ll cover it with a metal plate so you can drive out). There were lots of questions about the impact on street trees. Pruning and removal may occur, especially if a tree sits on top a water line or near the water meter (video). WSSC has identified 32 trees for removal, but about half of those are already slated for removal by the City of Rockville. The City has already gone through the neighborhood and marked several trees for removal with orange dots of paint (WSSC does not mark trees). WSSC will notify homeowners with a door hanger if a tree on the street will be removed and residents can contact WSSC if they have concerns or want to explore alternatives (the pros and cons for the various options are too complex to describe here because each situation is different, but I can say there are serious disadvantages for keeping a street tree, plus remember, street trees are city property and are in the public right of way). If a tree is removed, the stump will be ground down to 12″ below the surface and within a foot of the stump (roots further out will not be removed), and a new tree planted. Unlike the City’s recent sidewalk replacement project which left residents complaining about poor grading, deteriorating concrete, and landscape damage, WSSC assured residents that things will be much better (although we tend to always hear guarantees like this from utilities and public works before a project starts). WSSC is currently finishing up the planning and should be sending the project out to bid in the next few months. The number of water main replacement miles in their jurisdiction has exceeded 52 miles per year and will be constant or increase for the foreseeable future, with an average cost of $1.4 million to replace one mile of water pipe. As WSSC moves toward 100 years of service, Montgomery and Prince George’s counties are faced with aging (deteriorating) pipes and valves. As of December 2009, almost 26% (about 1,443 miles of water mains out of nearly 5,573 miles WSSC maintains) are more than 50 years-old. Approximately 1,973 miles of mains (35%) are between 31 and 50 years-old; 547 miles of pipe (10%) are 25-30 years old; the remaining 1,610 miles of pipe (29%) was installed in the last 25 years.